All 106 Super Bowl XLIV players ranked Peyton Manning is a no-brainer at No. 1, but who rounds out the top 10? Colts QB Peyton Manning recently claimed his fourth MVP award, so it stands to reason that he would top our rankings of the Super Bowl XLIV participants. But what about the other 105 players who are expected to suit up Feb. 7 in Miami? Who follows Manning? And who's No. 106? For each player in our rankings, we took into consideration his current performance and his play throughout the season. A player's special-teams contribution also influenced our decision. 1. QB Peyton Manning -- Colts He is the best quarterback in the NFL. An elite player with excellent physical tools. No quarterback works harder than he in terms of preparation, and that is why he is the most feared passer in the game. 2. QB Drew Brees -- Saints In just about every game Brees plays in, he would be the No. 1 player on the field. Finding negatives on this stud quarterback is incredibly difficult. If he wins Sunday, even fewer NFL players should be ranked ahead of him. It is already an incredibly short list. 3. WR Reggie Wayne -- Colts He is an elite receiver. He does not have elite speed but is an excellent route-runner. He shows the ability to separate at all levels. He has excellent hands and is a big-time playmaker. 4. DE Dwight Freeney -- Colts When healthy, he is one of the best pass-rushers in the NFL. He shows excellent first-step quickness and speed off the snap. He shows a burst to finish. The Saints will have to give Jermon Bushrod help on Freeney. 5. TE Dallas Clark -- Colts He is one of the best pass-catching tight ends in the NFL. He shows excellent versatility, in that the Colts can align him all over the field. He will often be Manning's first look versus the Saints' blitz pressure. 6. DE Robert Mathis -- Colts Like Freeney, Mathis is an excellent pass-rusher. He is explosive off the snap and shows very good closing speed. The Saints will try to run at him because if he has a weakness, it is defending runs directly at him. 7. S Darren Sharper -- Saints Not only did Sharper come to New Orleans and nearly win defensive player of the year, but maybe just as important, he also provided an invaluable veteran presence to a team that had been unable to get to the next level. He might just end up in the Hall of Fame someday. 8. CB Jabari Greer -- Saints The Saints' acquisition of Greer went rather under the radar, but he has been simply superb since arriving in New Orleans. He isn't that far away from the elite cornerbacks in this league, and if he puts together another season like the one he had this year, Greer will deservedly be in that conversation. 9. WR Marques Colston -- Saints The Saints have a ton of weapons for Brees, but Colston remains the top dog. He has very sticky hands to go along with great size, strength and body control. This is the receiver whom Brees trusts most -- which is saying something. 10. G Jahri Evans -- Saints Evans might now be the best guard in the league. Some of you probably have never heard of this guy. Well, it is about time you learned this name. He's big-time. 11. DE Will Smith -- Saints Just a step below the top 4-3 defensive ends in the league, Smith is still a fine player in his own right. However, like much of the Saints' defensive front, he was a liability against the run this season. 12. LB Jonathan Vilma -- Saints Vilma is an energetic Mike 'backer who needs to be protected in the run game -- New Orleans has not been good at that. He is strong in coverage, though, and provides excellent leadership. Vilma is a playmaker. 13. G Carl Nicks -- Saints Nicks and Evans make up the best guard tandem in the league. Although he is a small step below his linemate, Nicks is a massive road-grader who smothers his opponent. The Colts' smallish defensive front had better be aware of whom they are dealing with. 14. S Antoine Bethea -- Colts With the loss of Bob Sanders, Bethea has taken on a leadership role in the offense. He is the guy who gets everyone lined up. He is solid versus the run. Good range in coverage, playing man or zone. 15. LB Gary Brackett -- Colts He is one of the most underrated linebackers in the game. He does not have great measurables but plays more physically than his size and faster than his 40 time. He is very good at running the middle of the field in the Colts' Cover 2 defense. 16. WR Robert Meachem -- Saints After starting his career very slowly, Meachem lived up to his first-round draft status this season and simply exploded during the second half of the season. He is a physical specimen with a rare blend of size and speed. It is still all in front of this young man. 17. C Jeff Saturday -- Colts He is a tough, hard-nosed, blue-collar player. He is extremely smart and does a nice job handling Manning's checks at the line of scrimmage. He is just an average athlete, but has good short-area quickness in the Colts' zone-blocking scheme. 18. S Melvin Bullitt -- Colts He is the player who had to fill the shoes of Sanders. He is a very good run-support safety. He is a solid hitter and will make a lot of plays near the line of scrimmage. Not as polished in coverage, and the Saints will try to find him in the deep half. 19. OT Jonathan Stinchcomb -- Saints Because of the lack of tackle talent in the NFC this year, Stinchcomb was elected to the Pro Bowl. Although he isn't quite worthy of that honor, he is very solid in every aspect and is one of the better right tackles in the game today. 20. RB Pierre Thomas -- Saints Thomas is a jack of all trades but a master of none. He is somewhere between Reggie Bush and Mike Bell, and that versatility serves him very well. At his best when he doesn't have to carry the ball 20-plus times, and he rarely has to do so with this group of backs in New Orleans. Thomas did average a tremendous 5.4 yards per carry this season. 21. RB Reggie Bush -- Saints Somewhat of an enigma, Bush also is in the ideal situation for his dynamic skill set. Few players in the league are able to cause such problems with defensive personnel as Bush, since he is just as dangerous as a wide receiver as a running back. Oh yeah, he might just be the best punt returner in the league as well. 22. WR Pierre Garcon -- Colts This second-year receiver has been a huge factor in the postseason. Sees a lot of single coverage opposite Reggie Wayne. Unlike this wide receiver unit over the years, he brings big-time speed to the group. 23. RB Joseph Addai -- Colts He fits very well in this scheme. He is a one-cut runner who shows very good vision. He shows some burst to and through the hole but is not a home-run hitter. 24. TE Jeremy Shockey -- Saints Shockey no longer can handle a leading role, but in this offense, he has value as a physical over-the-middle supporting actor. He is injured too much and isn't the player he once was, but Shockey can still do damage. 25. LB Clint Session -- Colts He fits the mold of what the Colts like at outside linebacker. He has very good speed and range to make plays in space. He is not physical in line, however, and can struggle to get off blocks. The Saints will try to run at him. 26. WR Austin Collie -- Colts Rookie receiver who aligns in the slot in the Colts' three-receiver sets. He is extremely quick and is a very good route-runner. He is not big but shows toughness to make plays in traffic. 27. CB Kelvin Hayden -- Colts He is a perfect fit in their system. Does a nice job of rerouting receivers at the line of scrimmage. Plays the ball well in front of him. He is not as effective in man coverage if he has to flip his hips and run. 28. G Ryan Lilja -- Colts He is an undersized guard who is a good fit in the Colts' scheme. He is quick getting to the second level and can adjust in a short area. He is not a physical guy when he has a defender on his nose. 30. C Jonathan Goodwin -- Saints Goodwin is a wide-bodied, dependable pivot man who is fortunate to be flanked by a superb set of guards. But this guy is no slouch in his own right and does a nice job in both pass protection and the run game. He deserves more credit. 31. S Roman Harper -- Saints Harper complements Sharper well and is a good fit in this defense. He is best near the line of scrimmage and is quite effective in run support and as a blitzer. His coverage skills are just OK, and he is at his best moving toward the line of scrimmage. 32. CB Tracy Porter -- Saints Porter made a huge play against the Vikings. He is very fast and is progressing very well as a cover man. While you have to like his upside, he offers little against the run. 33. DT Sedrick Ellis -- Saints Ellis has a lot of ability and has shown flashes while plugging up the middle and as an interior pass-rusher. But Ellis hasn't played as well against the run as many tend to think and simply must become a more consistent overall player to fulfill his vast potential. 34. OT Charlie Johnson -- Colts The starting left tackle, he is a good overall athlete for the position. Shows quickness in his pass set. Can get lazy with his technique at times, so look for the Saints to dial up some blitzes to his side. 35. PK Matt Stover -- Colts He is a veteran kicker who was 9-of-11 in the regular season. He is still very accurate up to 40 yards, but keep this in mind: He had no 50-yard makes this season. 36. LB Philip Wheeler -- Colts He is an undersized linebacker with very good speed and range. He shows the quickness to beat blockers to the point of contact. His instincts in coverage have improved this season. 37. LB Scott Fujita -- Saints Fujita is built like an edge-rusher with good overall length, but that isn't his game. He is a solid contributor who could start for about half the teams in the league but lacks special qualities. 38. LB Scott Shanle -- Saints Shanle is similar to Fujita. He really struggled this season and could have a hard time securing a starting job in 2010. 39. DE Bobby McCray -- Saints A decent pass-rusher, but not good enough off the edge to be considered a true pass-rush specialist. McCray is effective as a third defensive end who can come in and contribute. But he isn't starting material. 40. WR Lance Moore -- Saints Undersized and not physically imposing, Moore caught just 14 passes this season as he consistently dealt with injuries. But last year, he caught 79 passes, including 10 touchdowns. When Moore is right, Brees can lean on him do to the dirty work. He moves the chains. 41. LB Freddy Keiaho -- Colts He is a former starter who does play some in the Colts' sub packages and on special teams. He does not run very well and is a bit of a liability in coverage. 42. RB Donald Brown -- Colts The rookie was a solid addition for the Colts. He runs with more pop than starter Addai. He runs with very good pad level and makes yards after contact. 43. P Pat McAfee -- Colts He is an excellent pooch punter. He had 21 punts land inside the 20-yard line with only six touchbacks. He does a nice job of directional punting, which we might see to negate the Saints' Reggie Bush. 44. CB Jerraud Powers -- Colts He is a short but plays bigger than his size. He is a very good tackler, which is key in the Cover 2. His route awareness will continue to improve with reps.
45. WR Devery Henderson -- Saints Henderson has been very up and down throughout his career. He is among the league's fastest players. Once just a bomb threat, he has begun to mature into a more complete player. 46. DE Raheem Brock -- Colts He is a veteran player who is a converted end. He lacks size for a DT but can win at times with quickness. Has to play on the edges because he is not a quick player in the interior. 47. OT Tony Ugoh -- Colts Former starting left tackle who showed promise early in his career. He has solid tools to work with and could benefit from a change of scenery. 48. PK Adam Vinatieri -- Colts He is on the roster but is not the Colts' starter in the postseason. He has been great for many years but is on the downside of his career. 49. RB Mike Bell -- Saints Bell is a true hammer runner who isn't truly gifted. But he gives everything he has on every carry and is extremely physical. Bell is best in short yardage, but he can help wear down a defense. If New Orleans looks to overpower the smallish Colts at the point of attack, Bell could have a prominent role. 50. CB Randall Gay -- Saints Gay is best suited as a sub-package cornerback, and this hasn't been his best season. Still, he has a place in any defense. 51. CB Jacob Lacey -- Colts He is a young starter with excellent upside. He shows very good ball skills and plays bigger than his size in run support. 52. TE David Thomas -- Saints A Patriots castoff, Thomas has found a home in the Big Easy. He's undersized for a tight end and is certainly a better receiver than he is a run-blocker. 53. CB Malcolm Jenkins -- Saints It hasn't gotten much publicity, but Jenkins hasn't lived up to his first-round draft slot during his rookie season. His future could be as Sharper's replacement at free safety. 54. DT Antonio Johnson -- Colts He plays in a rotation at defensive tackle. He is one of the few interior players on the Colts with solid bulk for the position. He is a run-down defender who is limited as a pass-rusher. 55. DT Eric Foster -- Colts He is a short, undersized interior defensive tackle who is not very physical at the point of attack but makes some plays when he is able to get up the field on the edges. 56. G Kyle DeVan -- Colts He is the starting right guard. He does not have great size but fits the Colts' offensive line philosophy in that he is a smart zone-blocker and can get to the second level. 57. TE Jacob Tamme -- Colts He is a backup who had three catches during the regular season. He is built more in the H-back mode, which the Colts like at tight end. 58. PK Garrett Hartley -- Saints In his two seasons in New Orleans, Hartley has attempted only 24 field goals. He has made 22 of them, and that doesn't include the clutch game-winner in the NFC title game against the Vikings. A larger body of work at this level would really help with his evaluation, but he has been impressive when he actually gets a chance to put it through the uprights. 59. OT Jermon Bushrod -- Saints Clearly the weak link on an exceptional Saints offensive line, Bushrod was thrust into action at left tackle after stalwart Jammal Brown was lost for the season. He is the worst starter on the Saints' offense. He did put the clamps on Jared Allen in the NFC Championship Game, but he did have loads of help. 60. DT Anthony Hargrove -- Saints A decent pass-rusher with some versatility to his game, Hargrove has been reasonably successful in the league and ideally can contribute as a wave player. 61. P Thomas Morstead -- Saints The rookie from SMU has great size as punters go and a big leg to go with it. He has saved his best efforts for the postseason, where he's averaging a whopping 48.2 per punt on 11 attempts. With a few more seasons in the league, his status should climb. 62. DT Fili Moala -- Colts Backup who had only seven tackles on the season. He has been dressing in the postseason as the fourth and last rotational defensive tackle. 63. CB Tim Jennings -- Colts He is a versatile backup who can align at both the cornerback or safety positions. As a corner, he shows very good quickness in the slot. His lack of height hurts him on the island. 64. G Jamey Richard -- Colts He started seven games as a rookie before moving into a backup role this season. His best asset is his versatility in that he can play center and guard. 65. G Mike Pollak -- Colts Former rookie starter who has moved into a backup role this season. He adds solid value to their interior, as he can play center and either guard spot. 66. DT Daniel Muir -- Colts Young backup who has already bounced around the league some. He is a good fit in Indy, and they are riding him as a starter right now, as he has delivered the ability to be stout versus the run. 67. DE Keyunta Dawson -- Colts He is a rotational DT who plays the 3-technique in their system. He is undersized and must play the 3-technique as a slant DT to be effective. 68. OT Zach Strief -- Saints Strief has been valuable when the Saints look to get physical and use him as a sixth offensive lineman. It was a tactic they employed against the Vikings, and it makes sense in the Super Bowl to pound the smaller Colts while also helping with edge pass-blocking against Mathis and Freeney. 69. S Jamie Silva -- Colts He is a backup who has seen more action of late because the Colts' secondary has been beat-up. He is a smart, competitive player who is better versus the run than pass. 70. DE Paul Spicer -- Saints A king-sized defensive end, Spicer has lasted in this league a long time with some ups and downs. His career is winding down in a hurry, but the Saints felt as though they might need him when Charles Grant went down. 71. WR Courtney Roby -- Saints Roby has had a strange career path, and though he's talented, he has never put it together as a wideout. Instead, he is making his mark on special teams as a return man for the Saints. He is adept at returning both punts and kickoffs. 72. G Jamar Nesbit -- Saints Nesbit has not had to play much this season and is suited for a backup role. But he is massive and can fill in at numerous spots on the offensive line. For those reasons, he is a nice guy to have around on game day. 73. LB Jonathan Casillas -- Saints Undersized by linebacker standards, Casillas moves very well and is aggressive. He is very good in pursuit, though, and has worked out well on special teams. There is upside here. 74. S Usama Young -- Saints A tall, well-built cornerback who can run, Young is somewhat stiff in transition and might be better off at free safety. 75. RB Lynell Hamilton -- Saints Stuck in an extremely crowded backfield, Hamilton has had very few opportunities to show what he can do with the ball in his hands. However, he hasn't been bad when given a shot and is a core special-teams player who is aggressive in both facets. 76. TE Darnell Dinkins -- Saints Dinkins is a glue player who has worked very hard to stay in the league as long as he has. Most people don't realize how valuable these type of guys can be to a team behind the scenes, and he won't embarrass himself on game day. 77. QB Mark Brunell -- Saints We all remember how good a quarterback Brunell was in Jacksonville in his prime. Now, he never sees meaningful snaps. It is difficult to speculate how far his game has dropped, but he does still fit Sean Payton's system pretty well, and his knowledge of the game surely is extremely valuable in the quarterback meeting room. As for ranking him -- we concede that this might be too low. Or if we saw him in action for an extended stretch, it might be too high. 78. S T.J. Rushing -- Colts He is a backup who has been active all season but sees little action on defense. He is one of their better special-teams players. 79. TE Gijon Robinson -- Colts He's a young backup who finished the regular season with nine grabs. A very good athlete with some raw skills to build around. 80. DT Remi Ayodele -- Saints A wide-bodied run-stuffer, he is just marginal in that capacity and offers next to nothing from a pass-rushing perspective. 81. S Aaron Francisco -- Colts Former Cardinals safety who landed in Indy last year. He is a very good special-teams player. 82. RB Mike Hart -- Colts Backup who has gotten more touches late in the season. They are not afraid to play him, as he is a good blocker and runs hard. 83. WR Hank Baskett -- Colts Backup who sees little to no playing time in the Colts' offense. He has value, but the Colts' young receivers developed, leaving him standing on the sidelines. 84. LB Anthony Waters -- Saints Waters is a hitter who helps on special teams and has a fair amount of ability, but he doesn't play with a really low center of gravity and can struggle as a take-on linebacker. 85. S Pierson Prioleau -- Saints Prioleau has been in the league a very long time, and although he isn't special in any one area, his experience is valuable. But his skills are declining, and he might not be long for the NFL. 86. C Nick Leckey -- Saints An undersized center who doesn't fit the Saints' beefy mold for interior offensive linemen, Leckey is a solid technician and a scrappy pivot man who could get them out of a game if Goodwin were to go down. 87. RB Kyle Eckel -- Saints A tough-guy fullback on a team that seldom uses the position, Eckel is very easy to root for. However, besides his effort, there isn't much here to get excited about. 88. RB Chad Simpson -- Colts The Colts do not really use a fullback in their offense, so he is basically the fourth running back. 89. QB Curtis Painter -- Colts We saw late in the season that he is far from being ready to play. He is smart and understands the system. He has a lot of work to do if he is going to be the Colts' backup in 2010. 90. LB Ramon Humber -- Colts Undrafted backup who saw some action this season, finishing with 32 tackles and a forced fumble. He is on the small side but runs well. 91. LB Troy Evans -- Saints This veteran linebacker is far from a household name, but he knows what it takes to stay in the league. He does his best work on special teams. 92. TE Tory Humphrey -- Saints Shorter than you would like for a tight end and just an average athlete, Humphrey makes his mark on special teams -- like most of the players at this area of our rankings. 93. LB Marvin Mitchell -- Saints Mitchell is a well-built linebacker who looks the part and does most of his damage as a special-teamer. 94. DT DeMario Pressley -- Saints This is a young player with some ability, but the production just hasn't been there thus far. 95. S Chris Reis -- Saints A safety with good size, Reis has value as a special-teams player and isn't bashful in that phase of the game. 96. OT Michael Toudouze -- Colts He is their backup fourth tackle, which means he is usually inactive on Sunday. 97. DE Jeff Charleston -- Saints He is a depth player who is well down the line in their typical defensive end rotation, but he also contributes on special teams. He is a much better player versus the run than the pass. 98. WR Adrian Arrington -- Saints Arrington has a big frame and can help out on special teams. He is a slow-twitch receiver but is very young, so improvement is possible. 99. LS Jason Kyle -- Saints Kyle is fine at what he does, but he is a long-snapper, so how high can we really rank him? 100. LS Justin Snow -- Colts He is the Colts' long-snapper. He does not have positional value but does a good job on kick and punt snaps with placement. 101. LB Cody Glenn -- Colts He is a backup who rarely sees the field. 102. QB Chase Daniel -- Saints Daniel was a big name in college and does have some potential down the line in this offense, but he is physically limited and has done nothing to get excited about. 103. DT John Gill -- Colts He is a backup who is buried on their depth chart. Has some measurables to develop as a backup. 104. DE Ervin Baldwin -- Colts He is an undersized backup whom the Colts are trying to develop. 105. TE Colin Cloherty -- Colts He is basically the fourth tight end on the depth chart. Versatile enough to play tight end or H-back in their offense. 106. WR Samuel Giguere -- Colts Developmental player who didn't accumulate any stats this season. Here is an article ranking the top secondaries, posted on NFL.com 6 months after Super Bowl XLIV, heading into the 2010 Season...it ranked the Saints as the 3rd best secondary in the league. 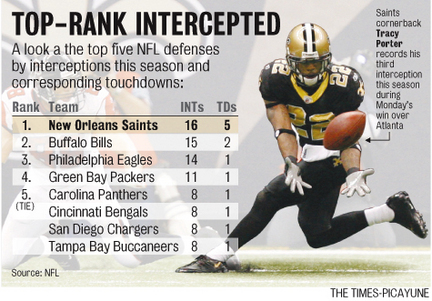 After Week 7 in 2009, the Saints were leading all teams in interceptions. 5. Drew Brees connects with Pierre Thomas for a 16-yard touchdown. The Saints took the lead for the first time off of Pierre Thomas's touchdown screen pass during the 3rd Quarter. This was the first Saints touchdown of the game, and made the score 12-10. 4. Drew Brees hits Lance Moore for 2-point conversion. This 4th quarter play was initially ruled incomplete, after being kicked away from Moore's hands by a defender. A Sean Payton challenge overturned the ruling, after review of the play, it was ruled a successful 2-point conversion, and that Lance Moore had both maintained possession long enough and crossed the goal line. The success of this play, made sure the Colts could not win the game with a single touchdown drive, making the score 24-17. 3. Garrett Hartley kicks his 3rd Field Goal from 47 Yards Away. 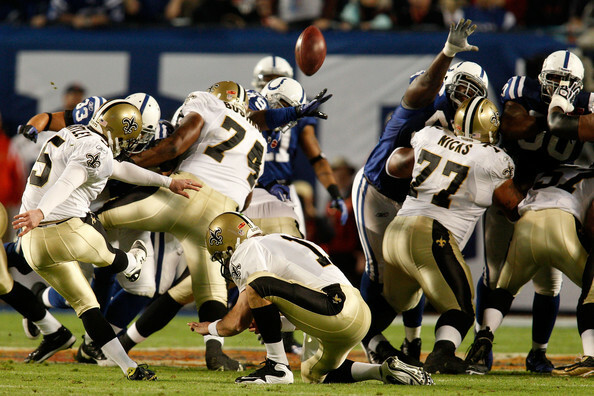 This kick brought the Saints to within one point of tying the game at 17–16 Colts. And with its success, Garrett Hartley became the first kicker in Super Bowl history to score three field goals of 40 or more yards in one game. 2. The Saints successfully convert an “Ambush” onside kick to start the 2nd Half. Thomas Morstead flawlessly executed one of the gutsiest and most iconic plays in Super Bowl history. "Ambush" was the code word for the onside kick performed by Morstead to open the 2nd half of Super Bowl XLIV. Recovered by Chris Reis, this not only gave the Saints momentum going into the 2nd half, but also took the possession away from the dangerous Peyton Manning and the Colts. 1. Tracy Porter intercepts Peyton Manning and returns it 74 yards for a TD. In the fourth quarter, New Orleans had taken a 24-17 lead with under six minutes left. On the Colt’s ensuing drive, Tracy Porter jumped the route of an attempt to Reggie Wayne, intercepting Manning’s pass and going 74 yards untouched to seal the 31-17 victory. No other team has EVER put up this type of offensive yardage stats consistently. See below the stats for Most Offensive Yards in a season by a team. In the past 9 years, the Saints have recorded in the top 30 All-Time, in 5 of the 9 seasons from 2006-2014. The Saints are the only team ranking below 5 different times. Of course nobody is saying this makes them the most complete team, some Super Bowl Champions are indeed listed below, the 2009 Saints and 1999 Rams, as well as Super Bowl participant, the 16-0 2007 Patriots Team. But the 2012 Detroit Lions listed below with the 4-12 record is the most glaring example that some of these teams were not remotely complete on all things, but in terms of offensive yardage, all the teams listed below had the most productive Offenses of All-Time. On December 24th, 2005 vs the Lions, the Saints were unable to score a touchdown during the game, for the 4th time that season, and they lost the game 12-13 having scored 4 field goals during the game. They would score a touchdown in the final game of the 2005 Season, a loss to the Bucs. They finished with a 3-13 record. Before the following 2006 Season, the Saints would hire Sean Payton as head coach, and sign QB free agent Drew Brees. The Brees/Payton Era of the Saints would start with that streak of the last single game of the 2005 season with a TD,. and from there extend the streak by getting a TD in every single game for the next 154 consecutive games, with the streak finally coming to an end vs the Houston Texans on 11/29/2015 when they were held out of the endzone for the first time since Sean Payton and Drew Brees arrived in New Orleans. In week 6 of the 2015 season, the Thursday Night Game vs the Falcons showed an onscreen stat having the Saints tied for 2nd All-Time in games with a TD at 151 consecutive games. This tied the Saints with the Chargers of 2002-2012 as of 10/15/2015. Ironically, Drew Brees was the starting QB of the Chargers from 2002-2005 and contributed to the first 4 years of the Chargers 2002-2012 Touchdown Streak of 151 games. The only team with a longer streak of at least one touchdown per game, is the 1957-1969 Cleveland Browns. Jim Brown would score 106 Touchdowns for the Cleveland Browns from 1957-`1965. ​ In 2002, the Sporting News named Jim Brown as the Greatest Football Player of All Time. Just like the dominant offensive yardage numbers the Saints put up year after year from 2006 to 2015, shown above, the streak of games with at least 1 TD had been another testament to this era of Saints unparalleled consistent, offensive production.